While going through my Google Reader, a recipe caught my eye. Pecan Pie Brownies? Yum, I love nuts and our Kentucky Derby Pie, which has similar ingredients, was awesome. I did cheat and use a boxed brownie mix as the base, Ghiraradelli since they taste the most homemade in my opinion. These came together in a snap and I was enjoying a nice warm brownie in no time. These were gooey and sweet but not as good as the pie. I may have had my hopes up a bit too high since we love the pecan and chocolate combo but I felt these could have been better. I may try again using a homemade brownie as the base but I don’t know if that will help, I just felt the topping needed a bit more flavor, salt? maybe bourbon, maple syrup? I am not sure. I will say that I ate half a pan in a day so these are by no means bad. If you are looking for a yummy twist on a typical brownie than I would recommend these, if you however want pecan pie and chocolate, make this pie. In a saucepan set over low heat, melt the butter, then add the sugar and stir to combine. Transfer the sugar mixture to a medium-sized mixing bowl, if you’ve heated it in a saucepan. Stir in the cocoa, salt, baking powder, espresso powder, and vanilla. Whisk in the eggs, stirring until smooth. Spoon the batter into a lightly greased 8″x8″ pan. Bake for 10 minutes while you prepare the pecan pie layer. While the brownies are in the oven, mix the pecan pie layer. In a medium bowl, combine the corn syrup and sugar. Whisk until smooth. Mix in the eggs and vanilla. Add the melted butter and stir until combined. After the brownies have baked for 10 minutes, remove from oven. Pour pecan pie layer over brownies and use a spatula to spread evenly to the edges of the pan. Return to the oven and bake for 35-45 minutes until pecan pie topping is completely set. Remove from oven and allow to cool, preferably overnight. Cut and serve with ice cream or whipped cream. My Taste Tester and I were hungry for some icecream and hot fudge and what goes better with those two sweets than a rich chocolatey brownie? I typically make these but had seen a recipe for a dark chocolate brownie that I had been wanting to try. These came together in no time but when I went to pour the batter into the 9×13 pan called for I found the batter to barely cover the bottom of the pan. I knew since there was no baking soda or baking powder in the recipe that they would turn out super thin. I decided to transfer the batter to an 8×8 pan and they still turned out thinner than I would have liked so I can’t imagine using a larger pan for these. The results were chocolatey but not overpowering. These are not my favorite brownies but did hit the spot when covered with vanilla icecream and hot fudge. I wish the flavor would have been a bit deeper or more complex, maybe some chocolate chips or walnuts thrown in would help. Melt butter and chocolate either in medium sized microwave safe bowl in microwave (stirring every 20 seconds until smooth) or in a double boiler. Once melted stir in sugar and mix well. Add vanilla and eggs mixing well. Add flour and stir to combine. This recipe showed up in my Google Reader a while back and I immediately bookmarked them. My Taste Tester and I love a good lemon dessert and we are in love with the lemon cheesecake I make each year for his birthday. I have tried other lemon bar recipes and was excited to give this recipe a whirl. The texture of these bars is more cake like than a typical lemon bar (as the name states). I thought I would like these more than I did. The lemon flavor was mild and pleasing but there is just something ‘missing’ with this recipe for me to make them again. Overall I liked them but they just did not ‘wow’ me. I may have had too high of expectations though. I did really enjoy the glaze and may use that on some fruit or on a white chocolate blondie to mix it up a bit. My Taste Tester thought they were “OK” as well but has not asked for them again which is usually a sign that the recipe is not a keeper for our house. 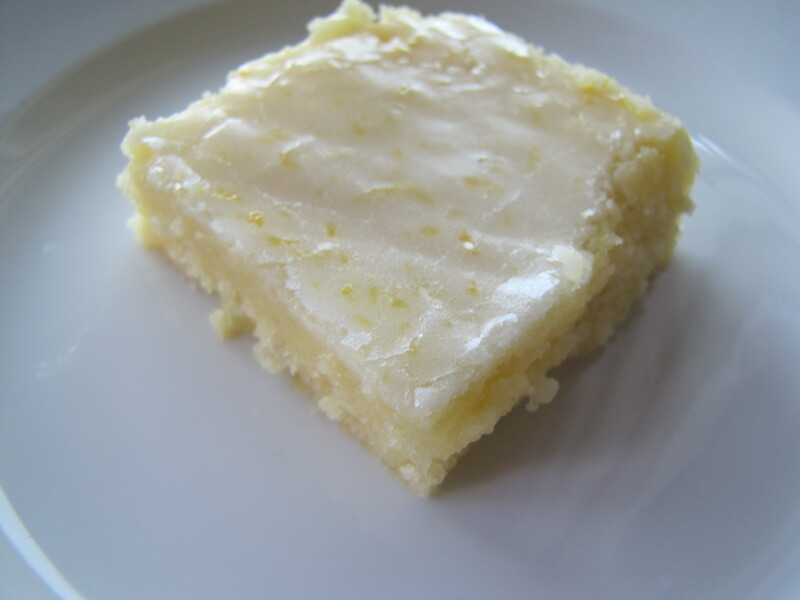 If you like lemon and are looking for a twist on a lemon bar, give these a go, the recipe is simple and easy and the bars are good for a refreshing summer treat. I would recommend eating these cool as the flavor does get better after a day or so. Spray an 8-by-8-inch baking dish with cooking spray and set aside. Zest and juice two small lemons; set aside. In the bowl of an electric mixture fitted with the paddle attachement, beat the flour, sugar, salt, and softened butter until combined. When brownies are cooled completely, make the glaze by whisking together all three ingredients. 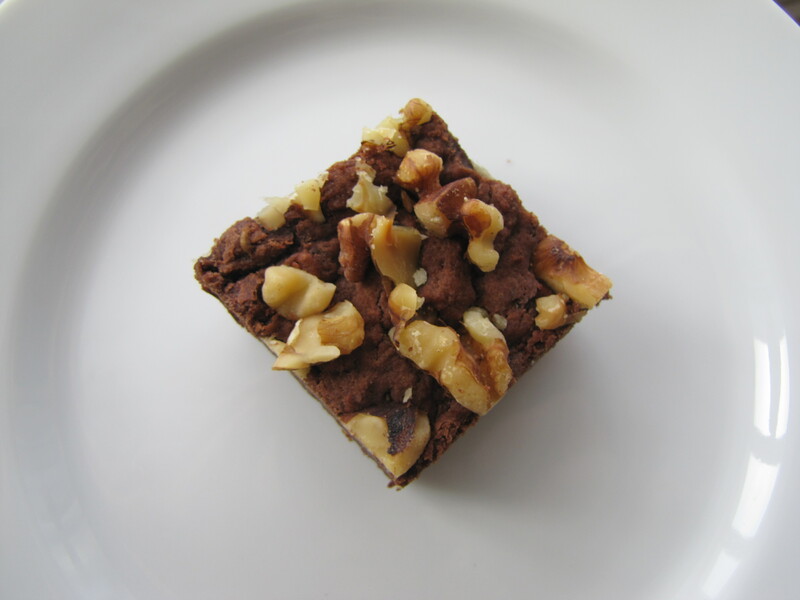 Spread over the brownies with a rubber spatula, cut into bars, and serve! I have had this recipe for years but just recently decided to whip up a batch. I don’t make brownies too often so I decided it was time to not only bake me up a chocolaty treat, but to try a new recipe. This recipe came together quickly because they only call for cocoa powder (no chocolate to melt). The end result is a brownie that is in fact very fudge-like with chocolate chips throughout. While I do like a fudge brownie now and then, these were too fudge-like for my tastes (If i make these again, I may bake a bit longer to see if that helps the texture be less fudgey). The flavor was rich but not overpowering, but I do prefer my tried and true recipe, though these were fun for a change. If you are looking for a quick and easy brownie recipe, this may be for you, especially if you are a chewy, gooey, fudge brownie lover. I also sprinkled walnuts over the top before baking. Gently mix until the dry ingredients are just incorporated into the wet, and stop. Stir in the chocolate chips. Line a 8×8 baking pan with parchment or foil. Pour the batter evenly into the pan. Bake for 20-30 minutes or until a toothpick comes out with a few crumbs. I have seen this recipe floating around several blogs for some time now. I have been delaying making these since they didn’t say “Summer” to me. Now that the air is cooler, I thought it would be great to give these a try. I printed this recipe off so long ago, I am unsure where I originally found it. 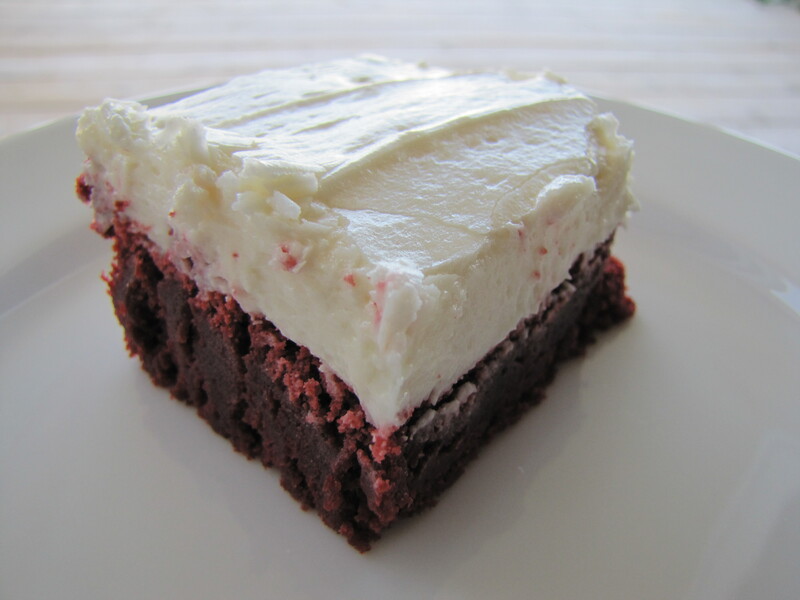 Google “Red Velvet Brownies” and you can take your pick at who should get credit for these. Typically in our household chocolate, peanut butter or lemon has dominated our top favorites. These little brownies however took our hearts. They are dense with a slight chocolate undertone. My Taste Tester described them as “tasty”. I typically do not care for cream cheese frosting but I loved it on these. I made my own frosting recipe up combining butter, cream cheese, vanilla, milk and powdered sugar until I achieved the flavor I liked. It was light, creamy with a slight cream cheese flavor. Overall it was great. I would make these again, they would be great for a potluck or school function. I think these would please chocolate lovers and non-chocolate lovers (those people exist?) alike. You can double the recipe easily to make a larger pan for large groups if needed. For the 2 of us the smaller size was perfect. Preheat the oven to 350 degrees F. Grease an 8″x8″ baking pan. In a small bowl, slowly stir together the cocoa powder, food coloring, and 1 tsp vanilla into a thick paste until no lumps of cocoa remain. Set aside. Remove the bowl from the mixer and stir up the batter with a rubber spatula once or twice just to ensure all of the flour has incorporated from the sides of the bowl and there isn’t anything stuck on the bottom of the bowl. Pour the batter into the prepared pan and bake for 30-40 minutes or until a toothpick comes out clean when inserted into the center of the brownies. Well, if 1 or 2 types of chocolate are not good enough for your brownie fix the this is the recipe for you.If you have been looking for a brownie recipe that has a texture nicely balanced between cakey and fudgy, is sweet but not cloyingly so and is great with or without nuts then look no further. This is a recipe I have tweaked and played with over time to make the perfect brownie as the base for a hot fudge brownie sundae! Some of my other recipes, while great on their own, were too sweet when paired with ice cream and hot fudge. Some became too soggy when topped with the hot fudge and others were just too one-dimensional in regards to flavor. When I indulge, I want to indulge. I want to taste and savor every last bite of that so-sinful-treat!So, I was on the hunt. I wanted a brownie that was a bit more complex flavor wise and could stand up to a scoop of ice cream without being too cake-like or dense.These brownies, in my opinion (well, isn’t everything on this blog my opinion? Kind of the point of a blog huh?) are exactly what a brownie should be. Don’t get me wrong, I LOVE a gooey sweet brownie like the next gal but sometimes I want and need something a bit more ‘grown up’. These fit the bill. This recipe’s complex flavor profile comes from the mixture of cocoa powder, semi-sweet chocolate, bitter-sweet chocolate and a dash of espresso powder. For those not familiar with espresso powder, you should be. It is super cheap, a little goes a long way and it will bring out and intensify the chocolate flavor in many recipes (if Ina uses it, you should too). You can not detect a coffee flavor in the final product (unless you are way too heavy handed with the espresso). What you will end up with is a deeper more complex chocolate flavor that you can’t get with chocolate alone (at least in my opinion) While these are wonderful wonderful brownies, I would not say this is my favorite brownie to just snack on (look here) but this is my favorite brownie to use for Hot Fudge Brownie Sundaes. On their own they are good, sure. BUT something magical happens to them when topped with a big ol scoop of vanilla ice cream and then drizzled with hot fudge and (if you’re me) topped with walnuts.I like to warm the brownie for 7 seconds, top with ice cream, a drizzle of homemade hot fudge and then some nuts. As the ice cream melts it gets into the nooks and crannies of these brownies but they hold their own, the texture, the flavor, the goodness that a brownie should be. 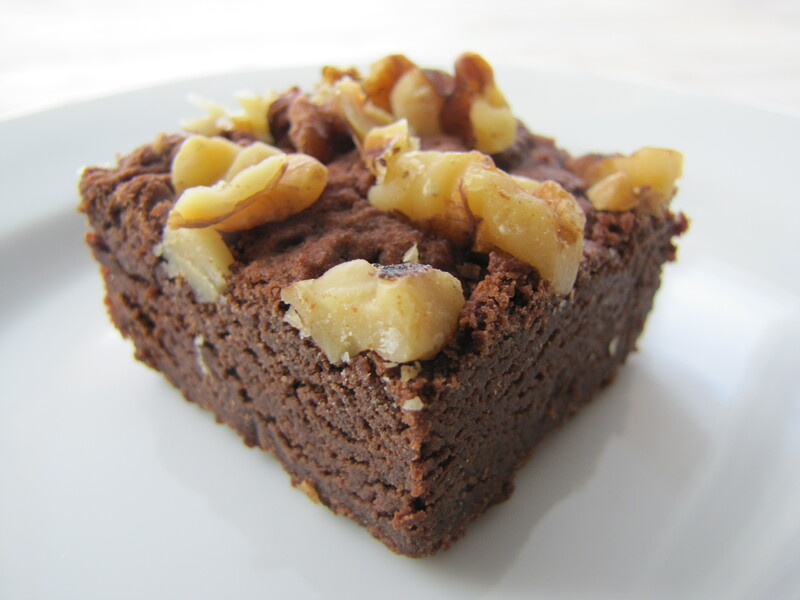 So, if you are looking for a good brownie recipe to indulge in, use this recipe and upgrade your dessert. No one will care it is store bought ice cream or hot fudge when eating this treat! In a microwave safe bowl melt the chopped chocolate and butter on medium power until melted, stirring every 30 seconds. Do not over heat. Stir in cocoa powder and espresso powder until combined. In a small bowl wisk together the eggs, sugar, vanilla and salt. Slowly wisk into the warm chocolate mixture and stir to incorporate. Gently stir in flour until just combined. Spread mixture into prepared pan. Bake for 30-40 minutes until a toothpick inserted into the center comes out with a few crumbs. Do not overbake. Allow to cool before cutting (or not). To serve, cut a large brownie, microwave for 20 seconds, top with icecream and hot fudge. Induldge. This recipe caught my eye several weeks ago. I was searching for a dessert recipe to use up a can of Sweetened Condensed milk and was in the mood for somthing different than my usual Magic Cookie Bars. This reipce combines several of my favorite flavors: Chocolate, Peanut Butter and Marshmallows. Another great thing about this recipe is that it uses a boxed cake mix keeping the ingredient list small. While these were a breeze to whip up, it was a little time consuming. First you need to make and par bake the chocolate base. Next you need to make the filling, pour over the partially baked crust and then bake again. From start to finish these took about an hour for me, which on a hot summer day can feel like torture. I also had a difficult time evenly spreading the sticky marshmallow/peanut butter filling over the crust. The filling was thick and way to hard to spread even with a buttered knife/spoon/spatula (maybe I was just having an off day). I ended up plopping spoonfulls of filling all over the crust and then with a greased knife did the best I could at trying make sure the crust was covered entirely. This worked well as the filling did thin and spread while baking. The flavor of these bars made up for my frustrations while preparing them. They came out of the oven smelling faintly of peanut butter with bubbling marshmallow peeking through the chocolate topping just begging to be enjoyed. I waited about 30 minutes and then ate one warm. Don’t overbake as they are supposed to be a bit gooey when you take them out, they will firm up a bit as they cool. The crust was sturdy but not hard, the filling had a subtly noticable peanut butter flavor and very similar to cheesecake in texture but gooier. Overall these were really great brownies and were enjoyed by all, even the non-peanut butter lovers (yes they do exist). 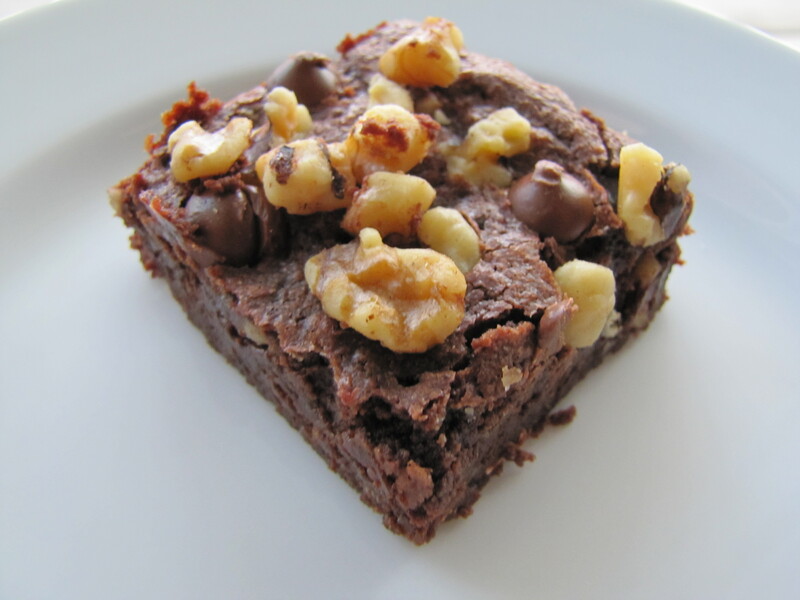 While these brownies were yummy, they don’t beat out my favorite! I did adapt this recipe a bit (based on my preferences and reviews) as reflected below and would recomend you do the same. Next time I will add some chopped Reese’s PB cups over the top of the brownies the last 10 minutes of baking to marry together the two flavors more fully. 1Set oven to 350 degrees. 2Grease a 13″ x 9-inch baking pan. 3In a bowl, combine 1/4 cup condensed milk, butter, 1/4 cup milk, cake mix and the egg; mix to combine well (batter will be stiff). 4Press TWO-THIRDS of the batter into the bottom of the prepared baking pan (using floured hands); pat down evenly, the layer will be thin. 6Meanwhile, combine the remaining 1/2 cup condensed milk and the marshmallow creme in a bowl; stir in the peanut butter chips/morsels. 7Remove the pan from the oven; spread the marshmallow mixture evenly over the brownie layer. 8Carefully drop the remaining batter by the spoonfuls over the marshmallow mixture. 9Bake for another 30 minutes. 10Cool completely in pan on a wire rack. Line a 9×13 baking pan with foil and lighlty spray with PAM. In a bowl, combine 1/4 cup condensed milk, butter, 1/4 cup milk, cake mix and the egg; mix to combine well (batter will be very stiff). Gently press about 2/3 of the dough into the bottom of the prepared baking pan (using floured hands if needed); pat down evenly, the layer will be thin. While crust bakes, combine the remaining condensed milk, marshmallow creme and Peanut Butter in a bowl; gently fold in the peanut butter chips and chocolate chips. Remove the crust from the oven; spread the peanut butter marshmallow mixture evenly over the brownie layer. Carefully drop the remaining batter by the spoonfuls evenly over the peanut butter marshmallow mixture. Press down slightly. Bake for another 25-30 minutes or until edges are set and center is slightly gooey but not raw. Cool completely in pan on a wire rack.